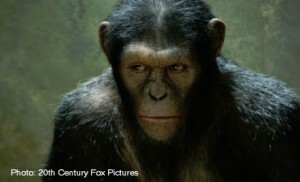 RISE OF THE PLANET OF THE APES: New Sneak-Peek at the Human Side! 20th Century Fox Pictures is bringing the prequel story to “Planet of the Apes” the original 1968 film series based on the 1963 novel about a land after the extinction of mankind where the apes ruled the world. “Rise of the Planet of the Apes” is the story of Caesar. An ape raised by a human family consisting of a father with Alzheimer (John Lithgow) and scientist son (James Franco) who continues his drug study in finding a cure for Alzheimer by experimenting on Caesar. Caesar isn’t exposed to other apes until later in his adulthood. Caesar, through performance capture technology, is portrayed by actor Andy Serkis (a.k.a – the first performance-capture star) who also portrayed Kong in “King Kong”, and Gollum in “Lord of the Rings”. During a press conference at Caltech, Serkis talked about preparing to play Caesar who “was not just a generic ape.” Because he was raised by a human family, made the role for him one of the most emotionally challenging. When asked how he gets into character with being only in the performance capture suit and not physically dressed as the character, Serkis stated, “The suit allows you to not be restricted. It’s a very liberating costume”. Director Rupert Wyatt said that this prequel to Planet of the Apes takes place in contemporary times. “It’s a re-boot. We’re working our way towards the original. When we get to where the 60’s show is we’ll look back at this film”. Wyatt also stated that the studio did not pressure him to make this film in 3D. Senior Visual Effects Supervisor on the film Joe Letteri said that the movie “is about getting into Caesar’s head and wanting to watch him. It’s more about the performance even with the technology. Andy was still able to make it settle.” Letteri said that they used an extension of the performance capture that was used in “Avatar”. In regards to the emotional story to “Rise of the Planet of the Apes”, Wyatt stated that the story goes from being a fairy tale for Caesar to being part of the real world where he is looked at as a freak by both humans outside of his family and other apes. Once around other apes, Wyatt said, Caesar uses his intelligence to rise through the ranks of other apes who are physically stronger than him, but not as smart, to become the alpha. “Rise of the Planet of the Apes” opens in theaters August 5, 2011.